Robbie Tucker continues to bang against the restrictions of the conventional pop formula. His passion for his touchstones including Roy Orbison, Paul McCartney, and Elvis Presley are evident in his unique brand of pop/folk. This is unmistakably Robbie Tucker – full of energy, zest for life, and always with a hint of his sense of humor and unique vision. It is a unique blend of eccentric rock and folk elements, with the songwriting sensibilities of pop. The album kicks out of the front gate with the driving “Dig That Feeling”, featuring twangy guitars, harmonica, hand claps, and HUGE vocals. The perfect start! Next up is “Such Good Friends”, a uniquely fun and uplifting song featuring ukulele, whistles, and dreamy Hawaiian-inspired sounds layered on a bed of energetic rock. In “Only This Fire”, we get to hear a slightly different side of Robbie. He leads us on a deep, introspective journey. The song is intimate and epic at the same time, featuring folky acoustic guitars, layers of electronic instrumentation, and beautifully ethereal orchestral samples. The pace picks back up with the ever-evolving and highly peculiar “With You”. 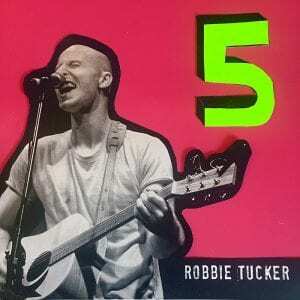 Robbie’s vocals call out like an anthem, with the music around him sometimes complimenting it and sometimes venturing off into eclectic moments of twisted resampling. This one’s a wild ride. Like the complimenting bookend to “Dig That Feeling”, the album ends with another driving rock song, “No Colours Are the Same”. At the halfway mark, the rock instrumentation breaks down to just Robbie and his ukulele and then builds back to a huge chorus before tagging out, ending the album on a very colorful note. All through it, Robbie really digs into his vocal performance for an intense rock sound. ← Camaro Sue has Met his Match!